This is a book that has a collection of sketches by an artist, Joe Ledbetter. 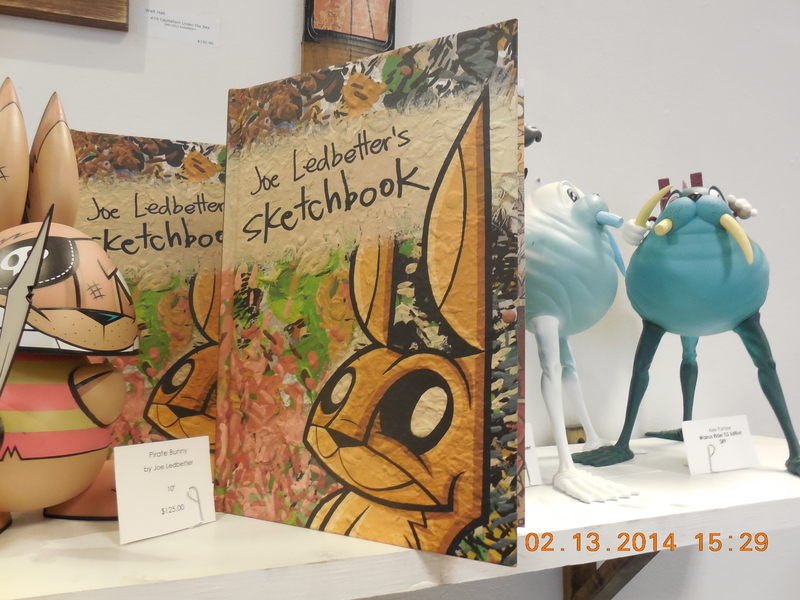 This is a cool sketchbook that has a collection of sketches by an artist, Joe Ledbetter. I found this in Art Whino, a modern and popular art gallery at National Harbor, Maryland. The sans serif letterforms in the title, Joe Ledbetter’s Sketchbook, on the cover of the book look childlike. It’s playful and has a hand drawn quality to it. The childlike and playful quality of the letterforms composing the title complement the fun sketches within the book. This graffiti art is by Banksy. This graffiti art is by Banksy, a graffiti artist, political activist, film director and painter from England. I came across this artist a few years ago. I found this art at http://banksystreetart.tumblr.com/. I like how this artist comments on society with his art and cleverly places it in environments. The graffiti typography created here is intelligent. 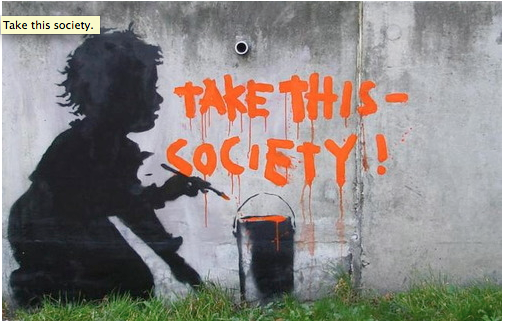 I like how Banksy created the typography to appear as though the child figure painted it. The dripping effect of the typography makes it come alive with movement. This simple and grungy technique is simple, but effective. 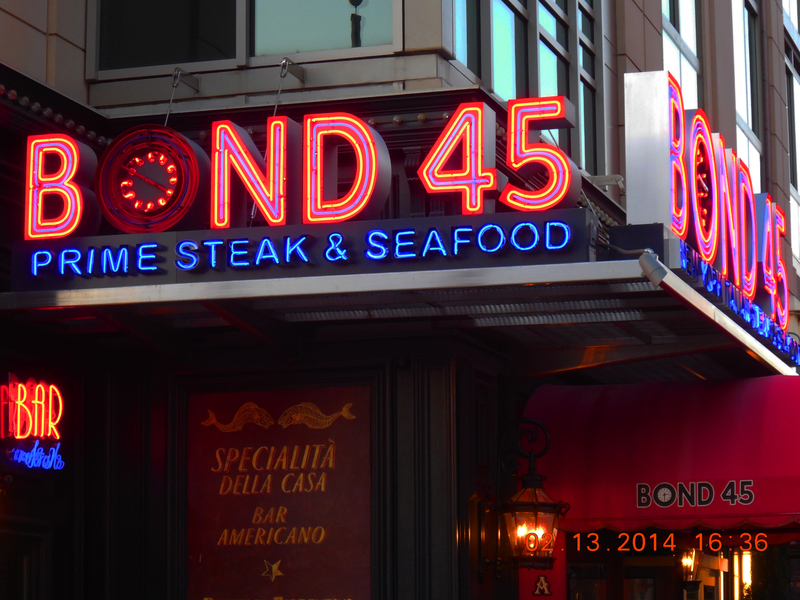 I found this beautiful and cool neon sign at National Harbor, Maryland. This is one of my favorite neon signs I’ve personally come across. The neon lettering is san serif, which makes it very easy to read from far distances. The vibrant neon lights composing the letter forms are very eye-catching as well. The counter of the “O” in Bond is a clock, which is very clever. This is an upscale restaurant and it shows in the sign. 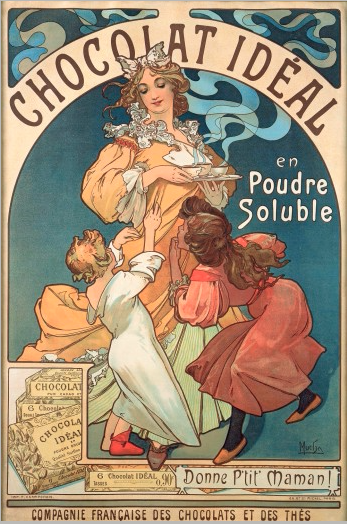 promotional material designed by Art Nouveau artist, Alphonse Mucha. This beautifully designed promotional material is by Alphonse Mucha, my favorite graphic design artist. I found this on www.muchafoundation.org. This is done in Art Nouveau style, which is my favorite graphic design movement. This style is hand-drawn including the whimsical and organic typography. The hand-drawn typography has a nice layout that compliments the illustration well and has has a strong visual hierarchy. This is a logo designed by Polemic Design for a company, Shaved. I found this clever logo in my favorite logo reference book, Logo Lounge3. I really enjoy referencing to this bestselling book for logo inspiration. The simplicity and cleanness of the logo makes it very strong. I appreciate how the letters of SHAVED were formed to appear as if it was actually shaved with the slanted letter effect. The word is still legible with the shaved effect. As a graphic designer, I use typography frequently. It’s always important to have a good sense of typography and to compliment designs with the correct typography style. One of my favorite typography type foundries I use is http://www.dafont.com. On this website, I can find numerous good fonts and download them for free. I also enjoy http://www.aiga.org because it’s a good website about all types of professional design including typography. Recently, I found http://www.typographica.org that is another interesting website about typography. Additionally, I recently found http://www.ilovetypography.com, which is a very informative and enjoyable typography blog.